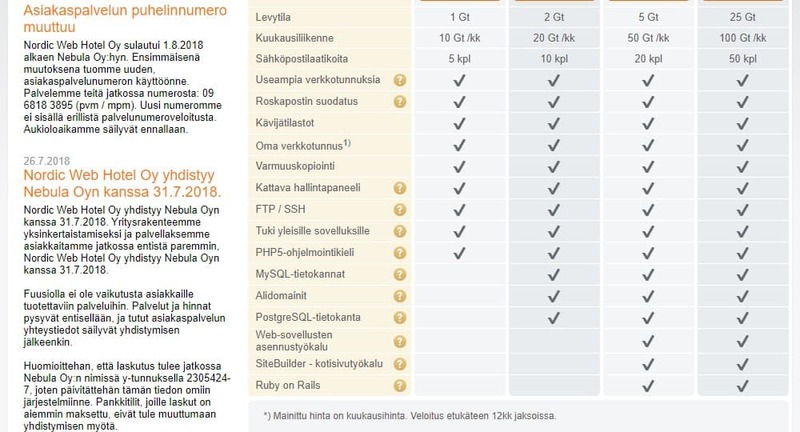 Webhotelli.fi Review 2019: Is Webhotelli.fi a Good Hosting? Webhotelli.fi is a Finnish-based web hosting provider with offices located in Helsinki. The vendor specializes in the provision of quality web hosting solutions targeting individuals and small enterprises not only in Finland but also worldwide. Webhotelli.fi offers hosting solutions to small business enterprises in Finland. Its offices are located in Helsinki, Finland. This Finnish company offers a number of internet services to its customers including web hosting, domain name registration services, and SSL certificates. In addition, the hosting vendor’s data centers are located in Helsinki to ensure that it offers fast and reliable services to its Finnish customers. Webhotelli.fi also targets small and medium-sized businesses in Germany, the U.S., Belarus, and Russia. Its website is only available in Finnish. Webhotelli.fi data centers are under 24/7 observation and are connected to a fast backbone network of upto 10Gbit/s to enhance the servers’ operating speed. The vendor’s hosting solutions are divided into four packages: Bronze, Silver, Gold, and Platinum. The packages include disk space ranging from 1GB to 25GB and monthly traffic from 10GB per month up to 100GB. All plans come with add-on features that include spam filtering and backup services. Its FTP/SSH support makes it easy for users to migrate their websites to its servers. The plans also include a simple website builder. This allows users to create a custom website even when they have no web design skills. None of Webhotelli.fi’s hosting packages include SSL certificates. Instead, Webhotelli.fi provides SSL certificates as an extra package suitable for online stores and other websites that require enhanced security. 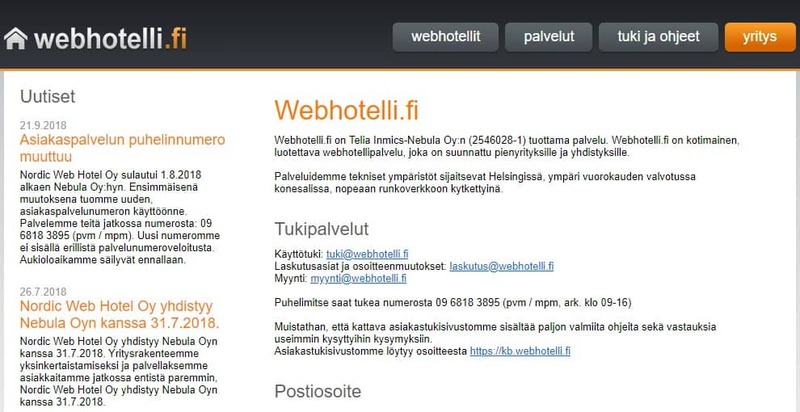 While the Webhotelli.fi website is quite easy to navigate, the information regarding its hosting solutions is pretty limited. Webhotelli.fi has somewhat reasonably-priced hosting plans, although the plans don’t have premium features that excite advanced webmasters. Prices are listed in euros and they are offered in one billing cycle where customers can make monthly payments. The vendor does not have a refund policy or any uptime network guarantee for its services. You can reach out to the Webhotelli.fi customer desk via telephone or email support. These are the only means of contact available to customers: there is no live chat or ticketing system available. Therefore, it’s not surprising that they don’t have round the clock customer support. Webhotelli.fi took relatively long to respond to my queries. I first received an automated email response (see screenshot below). The vendor would later (almost 48 hours from the time I sent out the email query) respond with an official response. Webhotelli.fi has a detailed help center with tutorials and an FAQ section aimed at offering answers to most of its customer queries. Although Webhotelli.fi hostings solutions are affordable, they are pretty basic. Moreover, the vendor doesn’t offer VPS or dedicated server solutions, and none of the packages features unlimited bandwidth or disk space. This can make scaling a challenge. Therefore, Webhotelli.fi is most suitable for small businesses that don’t require feature-rich packages. Wondering how Webhotelli.fi stacks up against other Web Hosting companies? Enter any other Web Hosting company and we will give you a side-by-side comparison.